Training in the heat of the summer or working outdoors in a tropical country can sometimes lead to dehydration or heat stroke. It would be helpful to have a heat alarm to warn of possible high and dangerous levels of the body’s heat index. 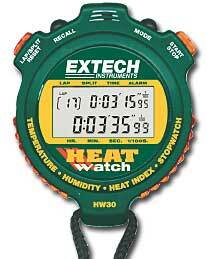 Designed to resemble a stop watch, the Extech Heat Watch heat alarm gives an accurate reading of the heat index of users to prevent any untoward incidents. It can be used by trainers or coaches to push sportsmen and sportswomen to the limit without crossing over the brink. Sudden thrusts in body temperature can be dangerous, sometimes even leading to death. The heat alarm device is endorsed by the National Health and Wellness Club.